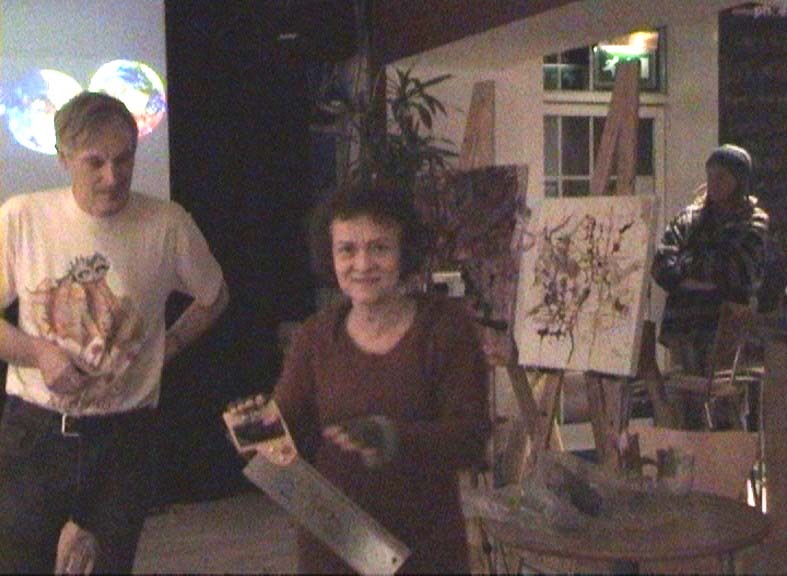 Kasia B. T. and I performed together as “Contemporary Art in the Community” at the first “Live Art Meets” event at the Exeter Phoenix art centre two months ago. We put our “performance” together with 1 1/2 days notice and were pleased to receive an enthusiastic response on the night followed by glowing reviews in our guest book. Kasia, Jim and Chris perform "The Cutting Edge of Modern Art" at the first "Live Art Meets"
http://www.fluxus.org/ can be used as a resource. For me Fluxus has been one of the most influential art forms. It is sometimes called an attitude rather than a movement and I feel that this attitude has enriched my every day life and outlook within it. At Art Meets we’ll be looking at some of the Fluxus scores in the Fluxus workbook and I hope you will join me in interpreting and performing some. JLH #1 by Takehisa Kosugi, Micro 1 “Wrap a live microphone with a very large sheet of paper. Make a tight bundle. Keep the microphone alive for another five minutes”. KBT #1 by Emmett Williams, The Gift of Tongues “Sing meaningfully in a language made up on the spot”. JLH #2 by Tomas Schmit, Sanitas No.35 ”Blank sheets are handed to the audience without any explanation. 5 minutes waiting”. KBT #3 by Larry Miller, Chewed Drawing ”Chew a nice piece of notebook or drawing paper”. This entry was posted in Performances and tagged Claire Burke, ConArtComm, Exeter Phoenix, Fluxus, John Cage, Performance Art, Psychology, Superstition, Yoko Ono by Jim. Bookmark the permalink. I want to hear the song in a language made up on the spot. That’s bravery. I’m biased of course, but personally I reckon two 5 MINUTE “performances” in a row tops even Kasia’s song in the bravery stakes! Actually I drew “the song” as well, but passed it on to Kasia. I guarantee that both you and the audience at the Exeter Phoenix are much better off for not having heard my “singing” voice! We’re all still eagerly waiting to discover what Claire’s camera ultimately reveals. You’ll be the first to hear if Kasia’s little lullaby has in fact been preserved for the edification of future generations. I was brilliant and brave! You were indeed. As you always are. You forgot beautiful though.